C. V. Raman discovered that when light interacts with a molecule the light can donate a small amount of energy to the molecule. As a result of this, the light changes its color and the molecule vibrates. The change of color can act as a ‘fingerprint’ for the molecule. Today Raman spectroscopy, which relies on these ‘fingerprints,’ is used in laboratories all over the world to identify molecules and to analyze living cells and tissues to detect diseases such as cancer. Raman’s father was Chandrasekaran Ramanathan Iyer, a student teacher of mathematics and physics. His mother was Parvathi Ammal, who was taught to read and write by her husband. At the time of Raman’s birth, the family lived on a low income. Raman was the second of eight children. Raman’s family were Brahmins, the Hindu caste of priests and scholars. His father, however, paid little attention to religious matters: Raman grew up to share his father’s casual attitude to religion, but he did observe some Hindu rituals culturally and respected traditions such as vegetarianism. When Raman was four years old his father got a better job, becoming a college lecturer, and the family moved to Waltair (now Visakhapatnam). In 1903, aged just 14, Raman set off for the great city of Madras (now Chennai) to live in a hostel and begin a bachelor’s degree at Presidency College. When Raman returned home after his first year at college, his parents were shaken by his unhealthy appearance; they set up a house for him in Madras, where he could be looked after by his grandparents. Raman was enormously enthusiastic about science. On vacations he would demonstrate experiments to his younger brothers and sisters. He completed his degree in 1904, winning medals in physics and English. His British lecturers encouraged him to study for a master’s degree in the United Kingdom. Madras’s civil surgeon, however, told him that his health was not robust enough to withstand the British climate; he advised Raman to stay in India. This was probably excellent advice. The brilliant mathematician Srinivasa Ramanujan, born just a year before Raman, traveled from Madras to work at the University of Cambridge in 1914. Although this resulted in the creation of some brilliant mathematical work, it had a severe impact on Ramanujan’s health. Raman was awarded a scholarship and he remained at Presidency College to study for his master’s degree. His outstanding potential was recognized, and he was given unlimited access to the laboratories, where he pursued investigations of his own design. In November 1906, aged 18, Raman had his first academic paper published. He had initially given it to one of his professors to read, but the professor had not bothered. Raman sent his paper directly to Philosophical Magazine and it was accepted. Its title was Unsymmetrical diffraction-bands due to a rectangular aperture: it was about the behavior of light. In 1907, aged 19, Raman graduated with a master’s degree in physics, awarded with the highest distinction. Although Raman was intent upon a scientific career, his brother persuaded him to sit the civil service exams. Civil service jobs were highly paid and his family was deeply in debt. For 10 years Raman worked as a civil servant in the Indian Finance Department in Calcutta (now Kolkata), rising quickly to a senior position. In his free time he carried out research into the physics of stringed instruments and drums. He did this work at the Indian Association for the Cultivation of Science (IACS). The IACS had been in a state of hibernation until Raman stumbled upon it and set about reviving it. In addition to his research work, Raman gave public lectures in Calcutta popularizing science. Raman’s part-time research work and his lectures were impressive, establishing his reputation as a highly talented physicist. In 1917 the University of Calcutta sought him out and offered him the Palit Chair of Physics. Although it meant a substantial cut in pay, Raman, now aged 28, accepted – the prospect of devoting all of his time to science was worth more to him than money. Although it was a research professorship, Raman also chose to give lecture courses: he was an exciting lecturer and he inspired his students. Lord Rayleigh, who had believed the teenage Raman’s papers were the work of a professor, had been one of the great physicists of his day. He had won the 1904 Nobel Prize in Physics. His importance to Raman’s story is that Rayleigh had been the first to explain why the sky is blue. He had then explained the sea’s color by saying it was simply a reflection of the sky’s color. One day, in the summer of 1921, Raman was on the deck of a ship in the Mediterranean Sea en route to the Congress of Universities of the British Empire at Oxford. He looked at the beautiful blue color of the Mediterranean Sea and began to doubt Rayleigh’s explanation of its color. Rayleigh had correctly explained that the sky looks blue because of a phenomenon now called Rayleigh scattering. An approximate representation of Rayleigh scattering in Earth’s atmosphere. If Earth had no atmosphere, anyone who happened to be around in such circumstances would see a white sun and a black sky. However, this is not what we see, because sunlight interacts with the gases in Earth’s atmosphere. Rather than coming straight to our eyes from the sun, sunlight is scattered in all directions by the atmosphere. Blue light is scattered most, meaning that it comes to our eyes from everywhere in the sky, therefore the sky looks blue. Yellow and red light are scattered least, so we usually see a yellow sun, and sometimes a red sun. Rayleigh scattering is elastic. This means that photons of light lose no energy when they interact with gas molecules. The light, therefore, stays the same color. When he sailed back to India in September 1921 Raman, an indefatigable scientist, had with him some simple physics apparatus: a prism, a miniature spectroscope, and a diffraction grating. He used these to study the sky and the sea and concluded that the sea was scattering light. Hence when Rayleigh said the sea’s color is simply a reflection of the sky’s color, he was not wholly correct. Raman reported his findings in a letter to the journal Nature. When he returned to his laboratory, Raman and his students began an exhaustive program of research into light scattering. In 1923 Arthur Compton in St. Louis, USA published exciting new work showing that X-rays can lose energy when they interact with electrons. The X-rays donate some of their energy to electrons, then move on carrying less energy. In other words, Compton demonstrated that inelastic scattering is possible. Compton received the 1927 Nobel Prize in Physics for this discovery, which became known as the Compton effect. The significance of the Compton effect is that in classical electrodynamics the scattering of X-rays and other electromagnetic radiation must always be elastic. Compton’s results agreed with quantum theory rather than classical theory. The inelastic scattering discovered by Compton caused X-ray wavelengths to increase. If inelastic scattering and hence longer wavelengths were possible for visible light, then the light’s color would change. Raman and his students continued researching light scattering in gases, liquids and solids. They used monochromatic light – sunlight that had been filtered to leave only a single color – and found that a variety of different liquids – sixty of them – did indeed change the color of the light. They first observed this in April 1923, but very weakly. Raman’s team observed the effect in gases, crystals and glass. The effect might have been mistaken for fluorescence, another phenomenon in which light has its color changed, but in Raman’s work the light scattered by liquids was polarized, which ruled out fluorescence. What came to be known as the Raman effect – a color change accompanied by polarization – had never been seen before. The inelastic scattering at its heart was a further, very strong confirmation, of quantum theory. (A) Blue light approaches a molecule, and then (B) Lower energy green light leaves the molecule. This is inelastic scattering: the light has given some of its energy to the molecule, causing it to vibrate more strongly. The Raman effect is a very small effect compared with Rayleigh scattering. Only about 1 in ten million photons undergoes inelastic scattering. Raman and his colleague K.S. Krishnan reported their discovery in March 1928 in Nature. Raman showed that the energy of photons scattered inelastically serves as a ‘fingerprint’ for the substance the light is scattered from. As a result of this, Raman spectroscopy is now commonly used in chemical laboratories all over the world to identify substances. It is also used in medicine to investigate living cells and tissues – even detecting cancers – without causing harm. Laser light rather than sunlight is used as the source of photons. In 1932 Raman and his student Suri Bhagavantam discovered that photons of light carry angular momentum – in quantum terms, photons possess a property called spin. Light and other forms of electromagnetic radiation pass their angular momentum on to atoms that absorb them. Raman married Lokasundari Ammal in 1907. The couple had two sons: Radhakrishnan, who became a distinguished astrophysicist, and Chandrasekhar. Raman was knighted in 1929 for his discovery of the Raman Effect, becoming Sir Chandrasekhara Venkata Raman. Raman’s Nobel Prize winning work was initially inspired by observations he made on a sea voyage. Coincidentally, it was on a sea voyage that another Indian Nobel Prize winner, Subrahmanyan Chandrasekhar, actually carried out most of his Nobel Prize winning work. 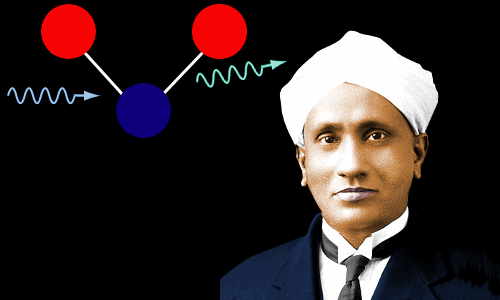 And, even more coincidentally, C.V. Raman was Chandrasekhar’s uncle! Raman had supreme confidence in his own ability. When the Palit Chair of Physics was endowed at the University of Calcutta, one of the conditions was that the holder would carry out research in other countries to increase Indian expertise. Raman refused to do this. He said that scientists should come from other countries to learn from him. He was so sure he would win the 1930 Nobel Prize that he booked tickets to Sweden four months before the winner was announced. In 1933 Raman became the first Indian director of the Indian Institute of Science in Bangalore. In 1947 he became independent India’s first National Professor. In 1948 he founded the Raman Research Institute in Bangalore, where he worked until the end of his life. "C. V. Raman." Famous Scientists. famousscientists.org. 30 Jun. 2016. Web.